Whoops! Long time no blog ... sorry friends :) Combine planning a rehearsal dinner with a wedding, and planning a festival, plus writing articles galore and my head is spinning! I miss all my blog friends and plan to catch up on my blog stalking later this week. Forgive me? SO...I have a quick blog post for tonight. I saw these ghostly treats in the Food Network magazine and thought they were so cute and easy! I plan to make them for Halloween if I have time! 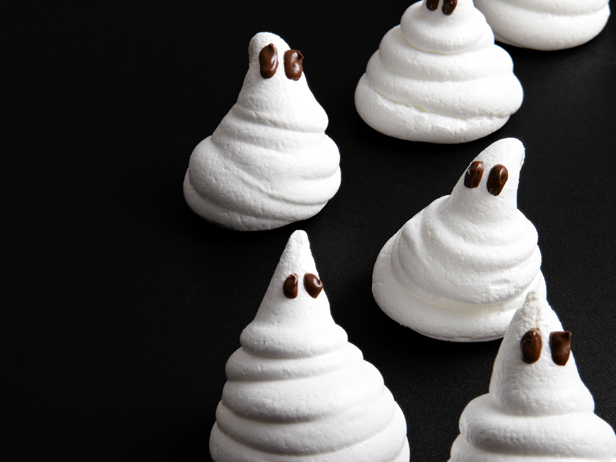 I love meringues and these are definitely the cutest ghosts ever. Not scary at all...maybe scary delicious...muah-ha-ha. Mmmmmmm...I love meringues...And those are adorbs!